How does a difference of $8140 increase to $19,536 which is an increae of over 130%? 1. Double the number (probably more, but for the sake of argument make it double) for the difference in air conditioning. I think Intel will have a slight advantage in this regard when it releases its Sossaman (or whatever he hell that's called) unless AMD can push its Opteron a bit more (a 40W version would suffice, considering that it has many benefits over the somewhat-crippled Sossaman). 1. How well do the Dempseys do using standard DIMMS? I know that Opteron is supposedly going to FBDs with the Socket F platforms (though that's uncomfirmed so far). There, FBDIMM is mentioned in 2007 (Platform overview). But I guess it will be DDR2. Historically AMD uses old, reliable RAM techniques at higher speeds, like PC133 SDRAM, DDR400.. and now it is DDR2-667/800. Just wondering, if AMD will introduce then another "Socket G" already by 2007 ? Dempseys should perform as badly as current Paxvilles if they use normal DDR2. This is because I seriously doubt anyone (basically, Intel) is going to make a quad-channel DDR2 controller since it requires lots and lots of traces and there's better technology out there (FB IS better, whatever everyone says, it's just having its introduction quirks). Remember that Netbursts are insanely bandwidth starved so having quad-channel DDR2 (which is enough to basically saturate the two 1066MHz Front Side Buses) is extremely useful in a two-way system. Once you get to 4-way, however, the bandwidth starvation comes back again. What do you mean?? 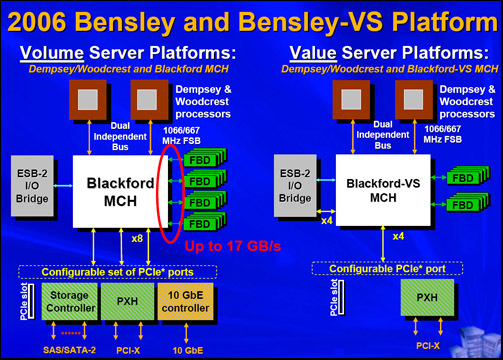 Bensley uses FB-DIMM 4-ch if you didn't know. And people who researches into these stuff/have looked into technical details say, Intel's memory controller design rivals the best, if not better. Also, Bensley uses DDR2-533, while Lindenhurst uses DDR2-400. We all know that DDR2-533 is faster than DDR2-400. Yes, but that's certainly better than Dual channel DDR2-400 with 800FSB since Bensley will have two FSB's anyway. Paxville and Dempsey has same amount of cache, only difference being Dempsey is clocked higher. If you read what you quoted again I said that Dempseys should perform the same as current Paxvilles if they use NORMAL DDR2 (as in not FB-DIMMs). I know there are 4 FB channels on Benseley but Viditor said that he wondered how Dempseys would perform on regular DDR2. Yes, Intel's memory controllers are among the best (nVidia's DDR2 mem controller is slightly better, I think) but I said that I don't believe they will make a quad-channel DDR2 northbridge, since the amount of traces coming out of a single chip would be insane. You're correct about Linderhurst sucking.